A recent legislative report proposed a series of recommended changes to North Carolina’s school finance system that could dramatically alter the way the state funds its public schools. If the General Assembly enacts the recommended funding changes, the net result would be a shift in funding from poor districts to richer districts. As noted previously, the report, prepared by the General Assembly’s Program Evaluation Division (PED), failed to assess the extent to which the existing system is meeting the needs of North Carolina’s students. North Carolina’s school finance system distributes funds to school districts through a number of formulas known as “allotments.” These allotments are meant to provide school districts with differing funding levels based on district or student needs. The allotments are simply the way the money goes out the door. Once districts receive their allotments, they have considerable flexibility to deploy their resources across schools in order to best meet the needs of their students. The goal of North Carolina’s school finance system is to allocate resources to each district relative to school district need, so any assessment of North Carolina’s school finance system must assess the extent to which resources are allocated in accordance with need. A 2010 report from education finance consulting firm Augenblick, Palaich & Associates actually examined the extent to which North Carolina distributes funding in accordance with need. Their report concluded that North Carolina’s school finance system distributes aid in an equitable manner and overall was working well. Instead of focusing on the equity of North Carolina’s school finance system, the PED report examines the specific allotments in isolation. This approach ignores the extent to which the formulas work together to direct funding in accordance with student needs. The PED report also fails to demonstrate how their recommended formula changes would impact individual school districts. What is more important is understanding how these formula changes would increase or decrease the extent to which total funding is aligned with student need. As mentioned above, there is no single measure of student or district need (which is a big reason why school funding systems are often complex). But North Carolina’s school finance system is progressive, providing relatively more funding to high-need districts than low-need districts. If PED’s recommendations were enacted, North Carolina’s system would become less progressive, transferring funds from high-need to low-need districts. 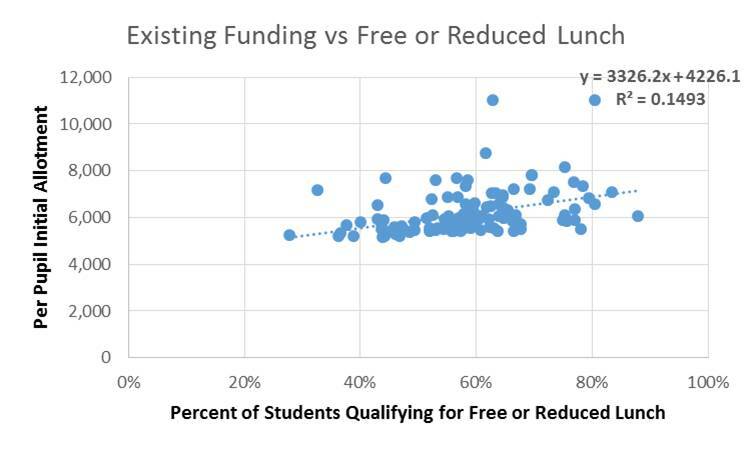 The charts below show the relationship between per pupil funding and the share of students in each district qualifying for free or reduced lunch. Under the current funding system, there is a positive relationship between per pupil funding and free or reduced lunch eligibility. 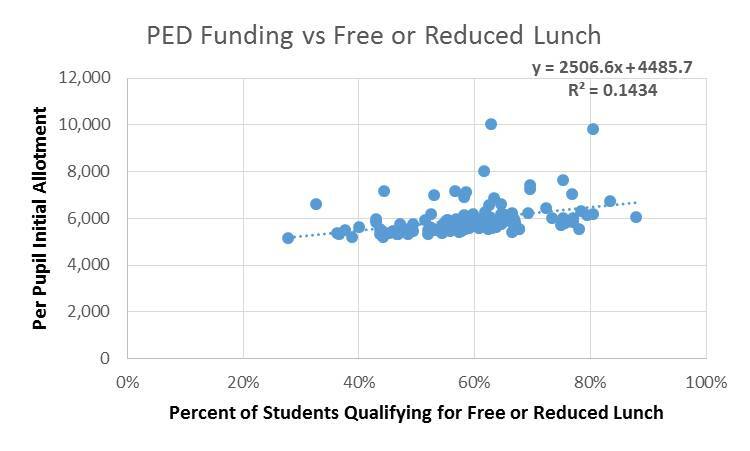 The upward-sloping trend line shows that, on average, districts with more students qualifying for free or reduced price lunch receive additional state funding. As shown below, PED’s recommended changes flatten the slope of the trend line, indicating that the modified formulas would shift funds from districts with higher concentrations of students eligible for free or reduced price lunch to districts with lower concentrations of students eligible for free or reduced price lunch. The same shift of funds from more needy to less needy is witnessed across other measures of need such as county wealth, per capita income, and child-aged poverty. The shift of funds is not massive, but, if enacted, would move North Carolina in the wrong direction. 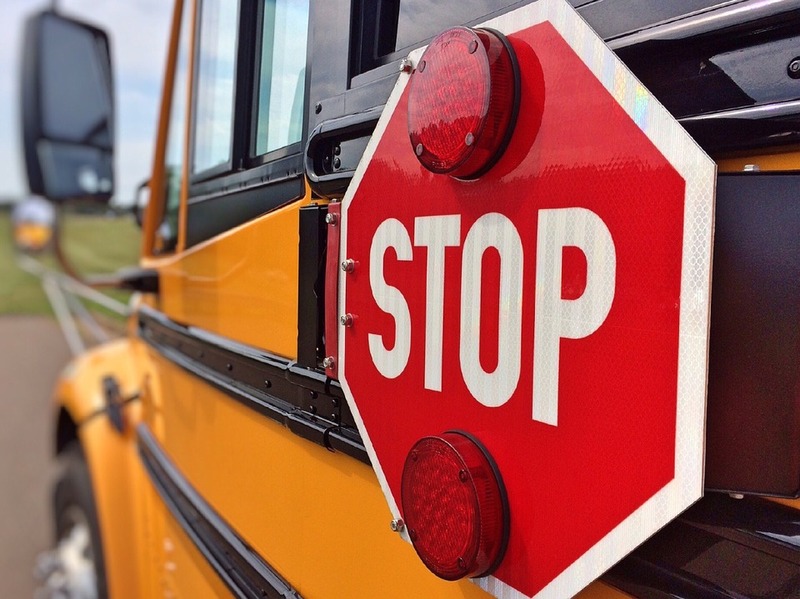 By shifting funds from poorer to less-poor districts, the PED recommendations would likely exacerbate resource shortages and achievement gaps between districts. Clearly define goals for North Carolina’s school finance system: Without clearly-defined, objective, statewide goals, the reform process can be taken off course by parochial interests. Ideally, the General Assembly will adopt goals via an inclusive process earnestly involving stakeholders, and that will strive towards equality of opportunity for all of North Carolina’s students. Measure the impact of any proposed reforms in relation to the stated goals: Allow stakeholders to clearly see whether reform proposals are improvements over the status quo, or if – like the PED report – they make the system more regressive. Examine whether funding levels are adequate to meet desired educational goals: North Carolina’s public schools are making do with fewer resources than they had even at the depths of the recession. North Carolina ranks among the worst states in the nation when it comes to per student funding and funding-level effort. The state can – and should – invest more in public schools. Even the most perfect school finance system won’t work if there isn’t enough money to be distributed. In the meantime, it is important that the General Assembly refrain from making changes to allotment formulas that will move North Carolina’s school finance system in the wrong direction on the basis of incomplete analysis.